The Krewe of Lafcadio signature throw is 14" wooden cooking spoons adorned with stickers and/or bows of colored ribbons imprinted "Krewe of Lafcadio". 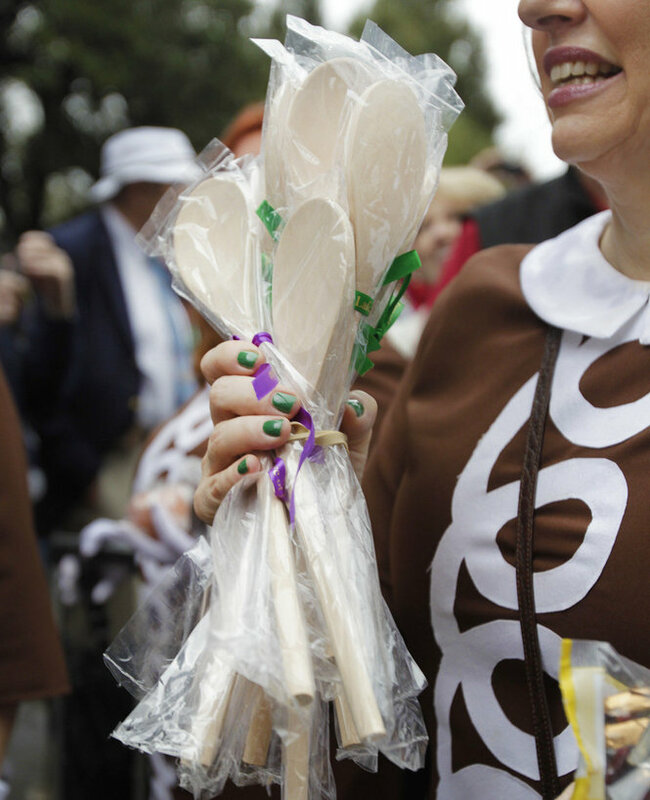 The mandatory throws package is $30 per marcher for 2 dozen wooden spoons with stickers/ribbons. This works out to ~1 spoon per block of the parade route per member. The spoons are distributed at the lunch when you sign in. Marchers may purchase additional throws for themselves through other outlets. Try to reinforce our culinary and cultural themes. As a marching parade you really want to put much more effort into your costume rather than expense into your throws. You may want to carry a few dozen "fancy" Mardi Gras throws along with your spoons but it is not necessary to spend much on throws and you certainly won't want to carry too much.